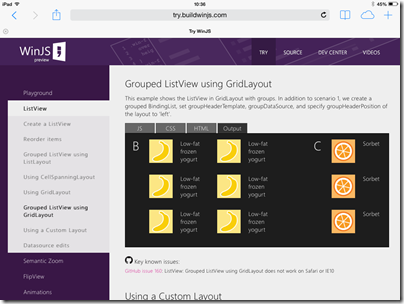 XAML and C#, or HTML and WinJS for Windows Store, Universal and cross platform apps? Microsoft’s line is that all three approaches are fine to use, with little performance difference other than that C++ avoids an interop layer. Of course if you have any arbitrary code that runs faster in C++ than in C#, then you will still see that difference in the WinRT environment. 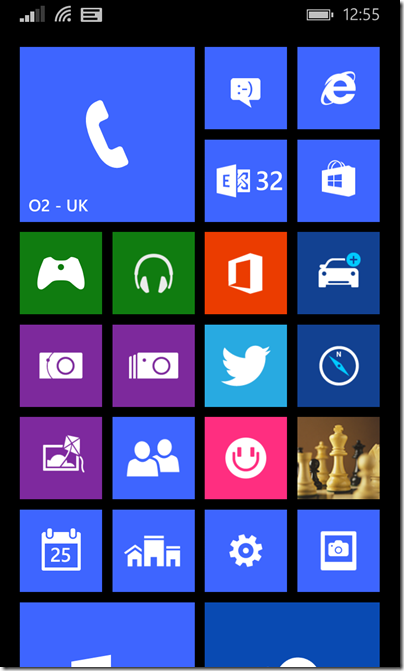 The library has been extended to smaller and more mobile devices with the release of WinJS 2.1 for Windows Phone 8.1, which was announced today at //build. Now that WinJS is available for building apps across Microsoft platforms and devices, it is ready to extend to web apps and sites on other browsers and devices including Chrome, Firefox, iOS, and Android. 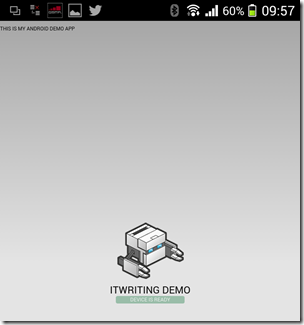 In order to sample this, I went along to try.buildwinjs.com on an iPad. All the things I tried quickly worked fine on iOS. If you used WinJS to build an app, you could use PhoneGap or Cordova to package it as a native application for the iOS or Android app stores. Another snag with this approach – leaving aside the questions of performance and so on which I have not investigated – is that you end up with the distinctive look and feel of a Windows 8 app, which is going to be surprising on these other devices. C# also has cross-platform potential, thanks to the great work of Xamarin and not forgetting RemObjects C#. 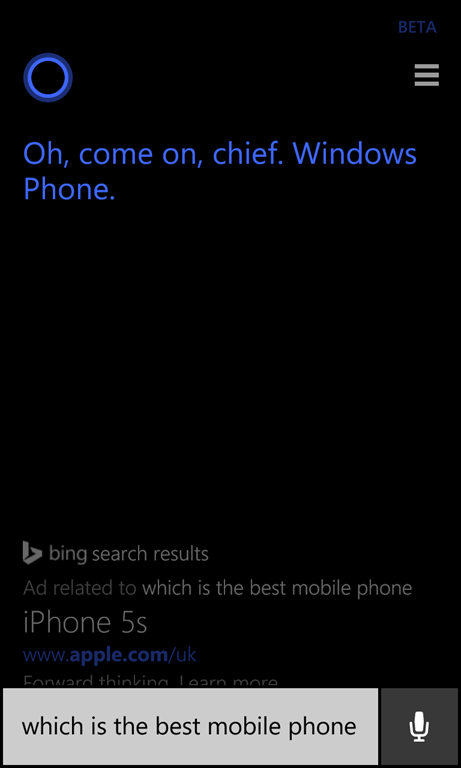 Note though that I wrote C# rather than XAML. There is no cross-platform XAML implementation other than the abandoned cross-platform Silverlight efforts, Silverlight for the Mac and Moonlight for Linux. Xamarin expects you to rewrite your UI code for each platform – which may in fact be a good thing, though more effort. As we looked around at the state of “cross platform development” on Windows, Windows Phone, iOS and Android we started to realize that C# was an excellent choice to target all modern mobile devices. So we did just that. With the help of Visual Studio for Windows and Xamarin for iOS and Android, we started a project to build a single version of Wordament’s source code that could target all the platforms we ship on. This release on Windows 8 marks the end of that journey. All of our clients are now proudly built out of one source tree and in one language. 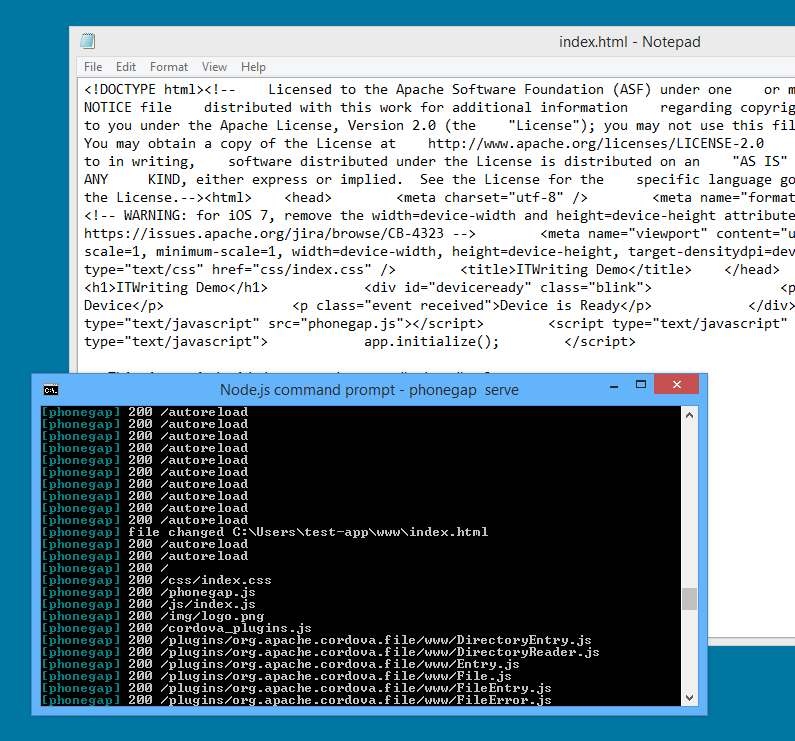 Even our service, which runs on Windows Azure, is built in C#. This is a huge efficiency win for our team of four. Notable also is that the forthcoming Office for WinRT, previewed at Build, is written in XAML and C++ (according to what I was told). This means XAML will get some love inside Microsoft, which is bound to be good for performance and features. An advantage of the C# approach is simply that you get to use C#, which is well-liked by developers and with some compelling new features promised in version 6.0, many thanks to the Roslyn project – which also promises a smarter editor in Visual Studio. 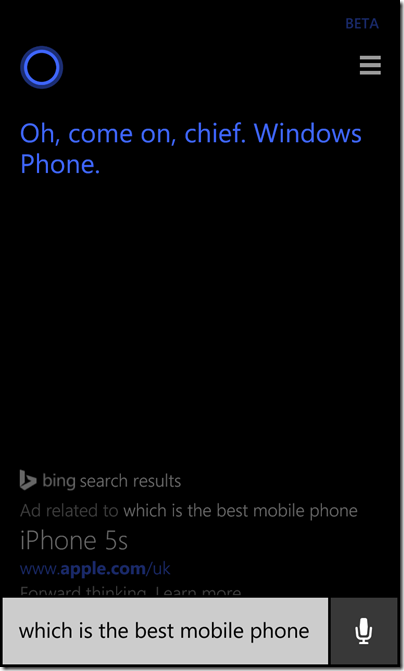 What about XAML? This is harder to love. XML is out of fashion – too verbose, too many angle brackets – and the initial promise of a breakthrough in designer/developer workflow thanks to XAML and MVVM (Model – View – ViewModel, which aims to separate code from user interface design) now seems hollow. I am writing a game in XAML and C# and do not much enjoy the XAML part. One of the issues is that the editing experience is less satisfactory. 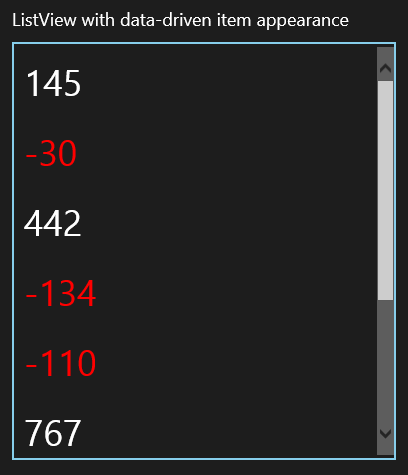 If you make an error in the XAML, the design view simply blanks out with an “Invalid Markup” error. Further, the integration between the XAML and C# editors is a constant source of problems. Half the time, the C# editor seems to forget the variables declared in XAML, giving you lots of errors and no code completion until you next compile. Even when it is working, a rename refactor in the C# editor will not rename variable references that are within quotes in the XAML, for example property names that are the targets of animations. 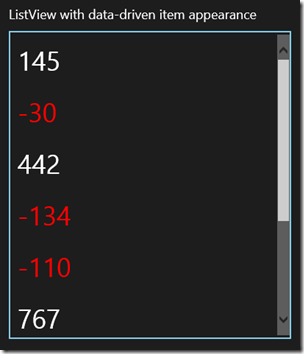 On the plus side, XAML is amazing in what it can do when you work out how. The user interfaces it generates are rich, scalable and responsive. It is way better that the old Win32 GDI-based approach (also used in the Windows Forms .NET API), which is hard to get right for all the combinations of screen sizes and resolutions, and has odd dependencies on system font sizes and dialog units (don’t ask). Despite the issues with XAML, C# and XAML (or C++ and XAML) is my own preference for targeting the new Windows platform, but I am interested in other perspectives on this. I am not a designer and prefer to avoid things like animation as too difficult. On the other hand, I am writing an electronic card game and it looks bad if the cards move without any animation. There is also an issue in that animation is built into the standard controls, so if you do not animate your own parts of the user interface, it looks inconsistent. Animation is more significant than it may first appear. You can think of it as a natural progression from a basic graphical user interface, along with things like full window drag. In the real world, objects do not just blink in and out of existence when they move from one spot to another. My game is a bridge simulation so four cards are laid on the table in turn, at which point the winner of the four cards is calculated and the four cards gathered to form a “trick”. In my original implementation, the four cards simply disappeared at the end of the trick. How can I have it so that they smoothly gather themselves into a pile of four cards? 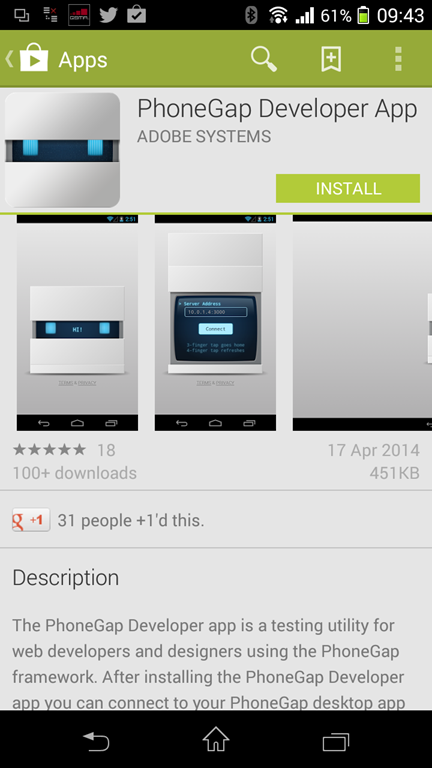 Like most things in Store apps, it proved a little more complex than I had thought. Originally, I put put each card in a separate cell of a layout grid. In Store apps, there is no built-in way to animate movement between grid cells, though users have come up with custom animations that do this. I thought it would be simpler to put the cards on a canvas instead. I did some sums and positioned four Rectangle objects at the borders of the Canvas. 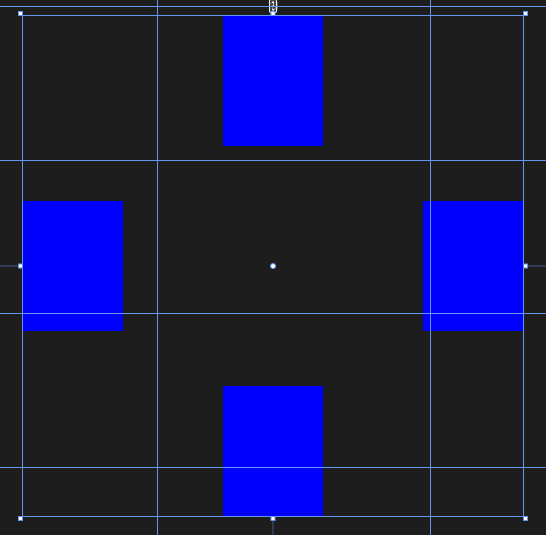 I want the Rectangle objects to slide smoothly into a pile in the centre. You do this in XAML with a Storyboard element. A Storyboard has child animation elements. When you call Storyboard.Begin() in your code, all the animations run. They run simultaneously unless one or more of the animations has a different BeginTime attribute. If you want a sequence of animations, you can either vary BeginTime, or use a KeyFrame animation which is designed for this. because it is an attached property. However, I chose to use a RepositionThemeAnimation. I found the way this works counter-intuitive. 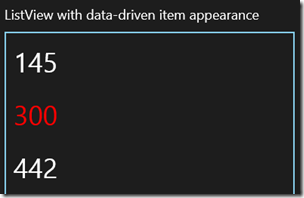 In XAML, you define a RepositionThemeAnimation with either or both a FromHorizontalOffset and a FromVerticalOffset. At runtime, the RepositionThemeAnimation moves the object to the offset position instantly, and then back to its starting point with animation. In other words, the animation itself does not move the object; unless you have AutoReverse set to True, in which case it does a second animation back to the offset position. In other words, you move the objects to where you want them, and then apply the animation which moves them temporarily back to their starting point, then smoothly to their destination. At this point I should include a little video, but will leave you to imagine the four Rectangles above sliding and merging to a single central Rectangle. then DoSomething runs before the animation completes. If this is not what you want, you can break at that point, and handle the StoryBoard.Completed event to resume. In my brief tests, StoryBoard.Completed always fires even if the animation gets interrupted, say by some other code that did something to the objects. For more on this subject, read up on Animating your UI and get to know the different animation classes, Visual states, easing functions, RenderTransforms and more. It soon gets complex and verbose unfortunately, but on the plus side it is great to have animation baked into the framework, and the result is a more polished user interface. The “Gross margin” figures above do not tell us much other than for hardware, since Microsoft no longer allocates its research and development costs against specific segments. Overall revenue is slightly down year on year but only because of a $1778 million decline in the “corporate and other” segment. This means it was a better quarter than the overall revenue suggests. So what is notable? Windows OEM revenue is up, but only thanks to the business market, and partly thanks to upgrades driven by the end of support for Windows XP. Consumer OEM Windows is down by 15%. Xbox revenue is up 45% thanks to the launch of Xbox One (and I have a hunch we will see less positive figures in future since Sony’s PS4 seems to be winning the console wars). Surface (Microsoft’s own-brand tablet) revenue is up by over 50% year on year, to $494 million. It is a significant business, though apparently not a profitable one. Cost of sales was $539 million, says Microsoft in its notes. These sums are a little puzzling. If growth was 101% overall, and Office 365 grew by more than 100%, where is the Microsoft Azure growth hiding, or was it from a very small base? Note that consumer Office 365 is accounted for separately, it seems, as part of “Devices and Consumer other”. There are now 4.4 million Office 365 Home subscribers, growing by around 1 million in this quarter. Questioned in the earnings call, CEO Satya Nadella talked about mobile-first and cloud-first, adding that the strategy goes across “devices some ours, some not ours.” He also mentioned how the advent of Universal Apps means that “we have a very different way to think about [Windows].” That is partly wishful thinking of course: the Universal App framework is still in preview and targets a still unreleased update to Windows Phone (8.1). Still, that is the strategy, even if it means giving Windows away on smaller devices – we have “monetization on the back end,” said Nadella, presumably thinking of Office 365 subscriptions and the like. On the business and enterprise side (where Microsoft can be more confident) Nadella also spoke of the synergy between Office 365 and Azure; every Office 365 sign-up enables Azure as a business cloud platform, thanks to Azure Active Directory and other integration points. I narrowed the problem down to an “Access denied” error when trying to create the profile, but we decided to restore Windows to factory settings (using recovery tools) since that was probably a better approach for the new user anyway – you never know what a developer may have tweaked or installed in Windows! 2. 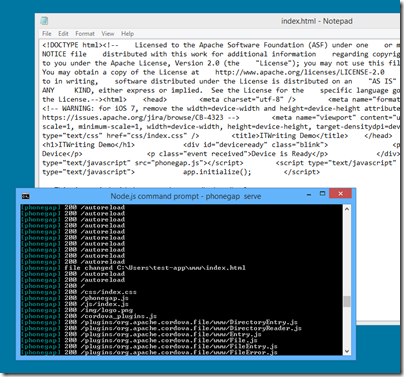 SQL Server 2014 Database Engine installation failing on Windows 8. The reported error: Could not find the Database Engine startup handle. Annoyingly, you cannot attempt a repair install if you get this, since repair cannot run if there has not been a successful install in the first place. 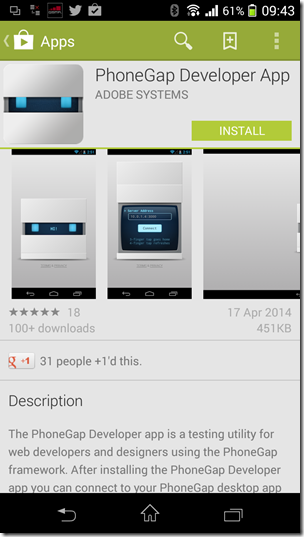 However this error does not rollback the installation, so you have the feature installed but not working. 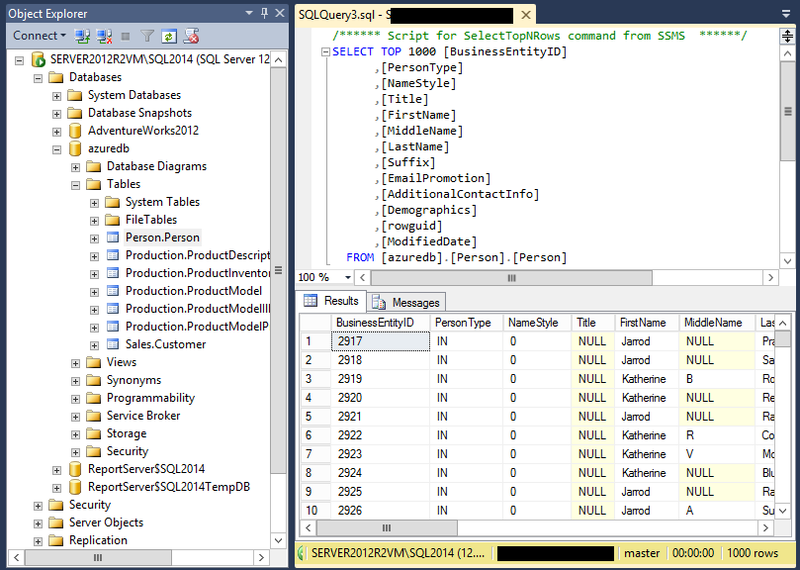 You have to remove the SQL Server feature using control panel, then you can retry. 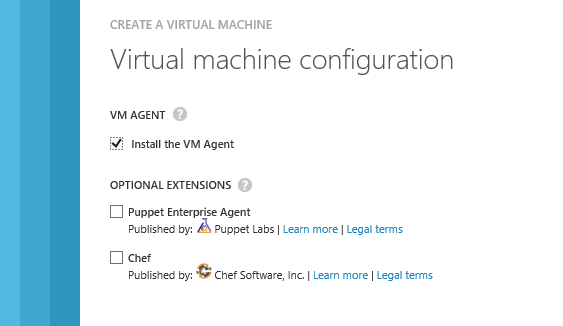 I got this on a couple of machines, tried a few things but failed, so used fresh VMs instead. Others have run into this and there is a solution, which applies to both problems. They are actually the same, since SQL Server 2014 creates a new profile in the default install. This solution means resetting the permissions on c:\users\default so that they are replaced with permissions inherited from the parent folder. This solution works; but it is not perfect, since these are the wrong permissions for the folder (too loose). Someone has done the job of finding the correct permissions for Windows 7. 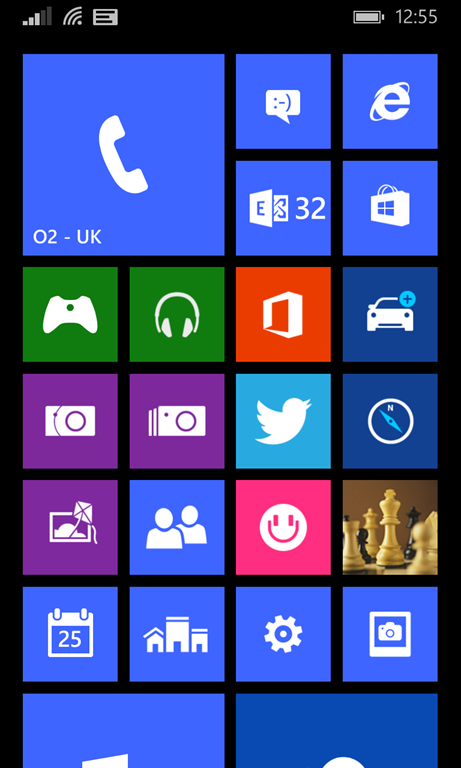 Applying all these is arduous though, and things may possibly have changed with updates since. In a production environment it would be better to narrow down the exact permission that is wrong, or to do a system restore. 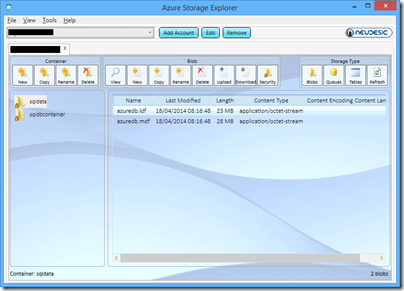 Click OK – it does not take long – and now new users can log in, and the SQL Server 2014 setup runs OK. The problem seems to be common so it is likely that either an official update or a commonly-used third-party install is breaking these permissions. I would be glad to know what it is; it would also be good if Microsoft would build into Windows a feature that would restore default permissions for a system folder like this one. Update: It may be sufficient to delete a single file. 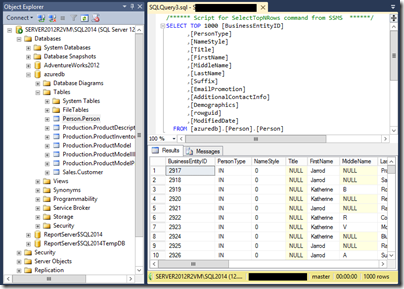 See this thread where event logs lead to a sqmdata…sqm file that, when deleted, fixed the issue. 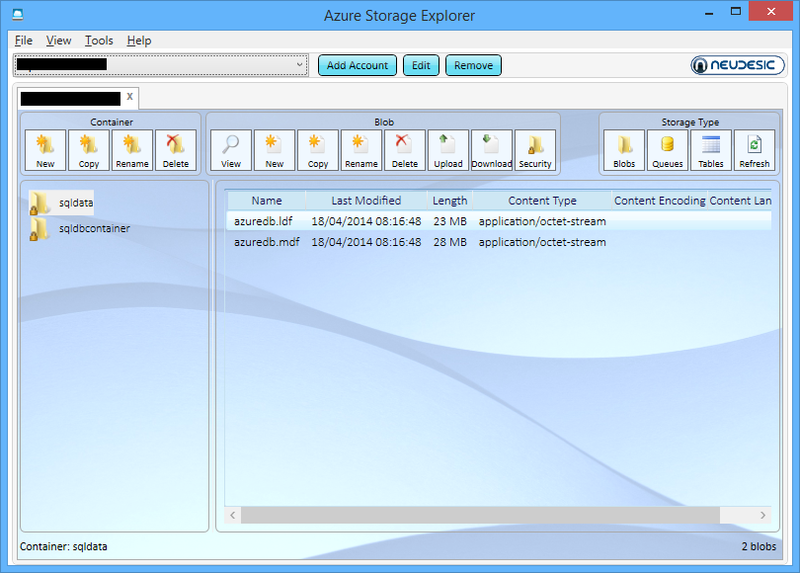 Check the Windows Application log for event 1509. Problem: You have a ListView containing data. You want to vary the appearance of items in the ListView according to the value of the data. I spent some time on this in relation to a panel for a game I am writing. For example, you have a ListView containing numbers. How can you have negative numbers appear in red? 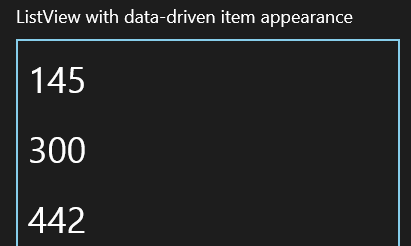 In desktop WPF (Windows Presentation Foundation) you could do this with Property Triggers but these are not supported in Store apps. One way to do this is with a value converter. Add a class to your project called MyValueConverter. 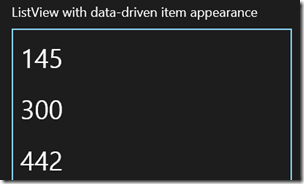 Make the class public, and inherit from Windows.UI.Xaml.Data.IValueConverter. Right-click IValueConverter and choose Implement Interface to have Visual Studio create two stub methods, Convert and ConvertBack. At runtime, the value argument will contain the item displayed in this row of the ListView. The targetType will match the type of the property we are setting, which in this case is a Brush object. Accept the default name of ListViewItemStyle1 and click OK. This generates an element that defines the layout and appearance of items in the ListView. Currently it does not appear to do anything, since it is a copy of the default settings. It works but there are some issues. One oddity is that when you roll the mouse over a negative number, it looks the same as a positive number. This is because we did a converter for the Foreground property but not for the SelectedForeground property. 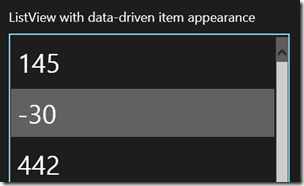 XAML in Store apps makes extensive use of themes, and themes include a lot of brushes. 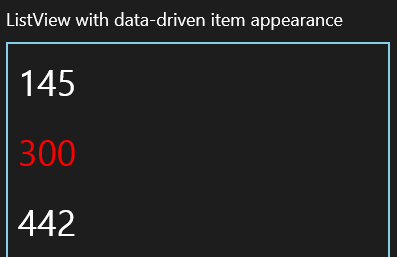 Another issue, which may or may not impact your application, is that the converter code does not run again if you change the displayed item dynamically. 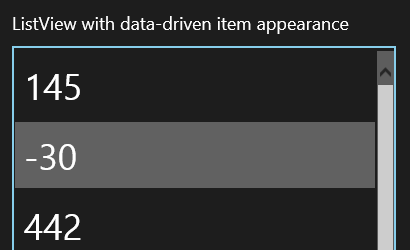 That is, if you replace the item it updates OK, but if you update the existing item it does not. A slightly more complex example will demonstrate this. Let’s say that rather than displaying strings, the ListView is displaying Widget quantities, where a negative number indicates backorders. The ListView is bound to an ObservableCollection<Widget>, and the Widget class implements INotifyPropertyChanged so that the ListView will update automatically when a Widget property changes. Note that the NumberForegroundConverter must be updated to accept a Widget value rather than a string. Oops! Now the positive quantity is in red. I used this approach in my game in order to implement an Enabled property that indicates items which are unselectable. This changes dynamically according to the state of the play. Note that you are unlikely to want a Foreground property in your business objects, but could create a DisplayWidget class for the purpose. I realise that these are not the only ways to create a ListView which styles items differently according to their values, but they may be the simplest. Other suggestions and comments are welcome. Update: Mike Taulty has some comments and suggestions here. 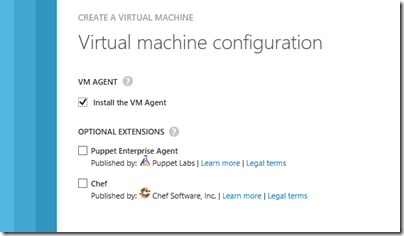 Puppet is for automating IT operations. Chef is for modeling IT infrastructure and application deployment as code.